PA STATES MAY 19-20, 2018 Players and draws will NOT be published online until deadline! This is a 2-Day Tourney. 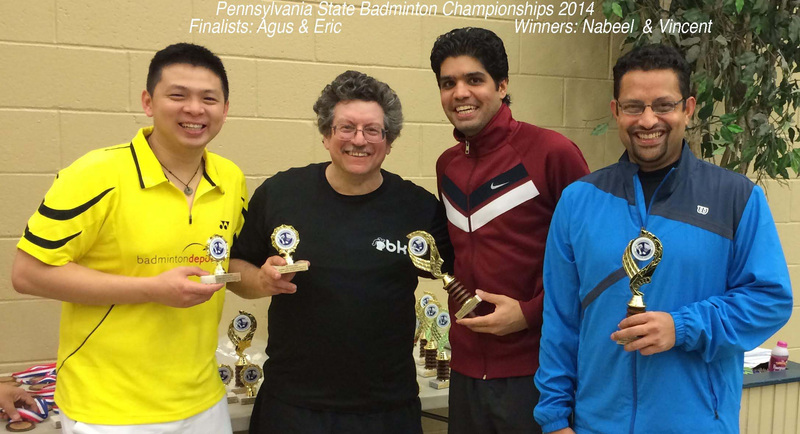 B Semis and Finals will be in Sunday as well as remaining cons matches and other matches not possible on Sat. 80 Players are coming! Draws and timings are expected to be posted on Wed night! 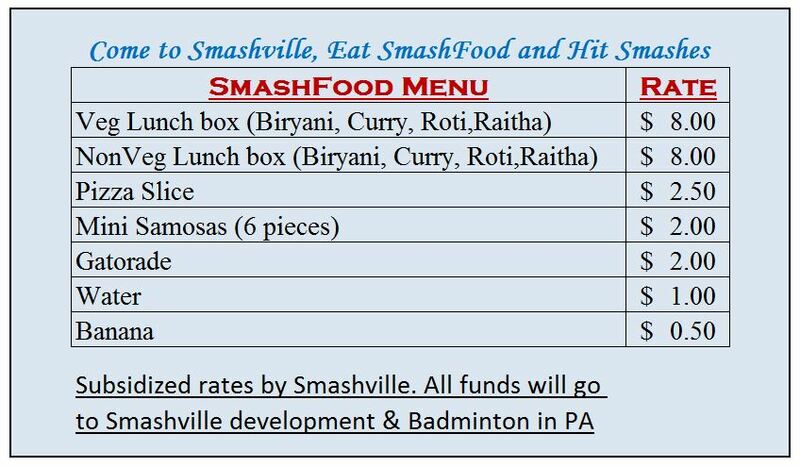 PA States FOOD MENU 2018! ENTRY DEADLINE : Sunday, May 13, 2018 at 11:59 PM – ALL Payments need to be in with entry thru TS website for entries to be valid. Any entries requested after the deadline are subject to availability and a $5. late fee. Any entries requested after the draws are posted are subject to availability and a $10. re-draw fee. We expect to post DRAWS and SCHEDULE late Wednesday evening prior to tourney. This is a 2-day Tourney! Be prepared for semi-finals and or Finals on Sunday. Some smaller draws and Round Robins may finish on Sat. FEE MUST ACCOMPANY ENTRY thru TS website or entry will NOT be valid. Mandatory facility fee: $10. (YMCA & Smashville members exempt). Entry Fee / player per event, 1st event $25. 2nd event $20. 3rd event $15. Additional contributions are optional. PAYMENT is DUE upon ENTRY SUBMISSION thru TS website! Completing registration constitutes agreement to waive all liability for injury or any damages. I agree to allow photos and video for promo purposes. All “request partner” entries will be reviewed following registration deadline. We will attempt to pair as many as we can, however we cannot guarantee that a partner request will be filled. We also cannot guarantee a congenial match as far as player temperament or level of skill. ALL PLAYERS must REGISTER-partners must register-Please make sure your partner has entered and paid! NO entries will be accepted after the deadline. Exceptions and additional fees listed above. Awarded to first 50 registered and paid entrants. A-Players that lose in the first round drop top A consolations. 2 matches guaranteed. A PLAYERS MAY ENTER B/C EVENTS with different A partner. A PLAYERS MAY NOT ENTER ROOKIES! B/C Players that lose in the first round drop to the C bracket. 2 matches guaranteed. B/C players MAY NOT enter Rookies. Rookie events will likelybe round robin format-you play all teams in your bracket -unless we have a large turnout. 16.1 The ranking in tournaments played under the pool system or in groups shall be determined in accordance with the Regulations 16.2 to 16.3. 16.2.1 Ranking in individual championships will be established by the number of matches won. 16.2.2 If two players / pairs have won the same number of matches, the winner of the match between them will be ranked higher. 16.2.3 If three or more players / pairs have won the same number of matches, ranking will be established by the difference between total games won and total games lost, with greater difference ranked higher. BE Prepared to play ALL DAY Saturday and Sunday thru 2pm! Trophies for winners and finalists. Mugs for semi-finalists, and Cons winners. Sponsorship opportunity-contact us if you would like to sponsor Prizes, T-shirts or shuttles!